"I believe this is what you're looking for..."
Bawdy is defined as "dealing with sexual matters in a comical way; humorously indecent." It adds a certain level of mischief to what are otherwise romantic proceedings and can be done with relatively innocent intent. 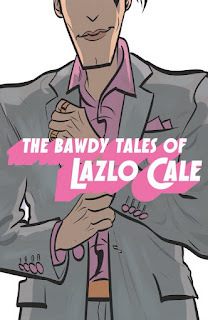 In The Bawdy Tales of Lazlo Cale #1, there's seems to be plenty of innocent intent to be had. The issue is written by Andrew Maxwell, illustrated by Goran Gligovic and lettered by Bernardo Brice. Our story takes place in a futuristic Paris, filled with interdimensional time portals, following an explosion of a literal time bomb. However, instead of erupting into chaos, the city became a unique ecosystem of different eras existing simultaneously together. Dinosaurs, samurai, and flying cars are just a few of things you might see on the city streets. The protagonist of this tale is an ex-gigolo turned art dealer, who uses this new set of circumstances to acquire art. He has recently been tasked with finding the city’s most notorious gangster’s stolen painting, or suffer the consequences. Oh, and did we mention this mobster is his ex-boyfriend? The book as a whole is really sort of a crime caper in which a piece of artwork serves as the central focus for all involved. The world created by Maxwell for the book is an anachronistic amusement park in many ways as it thrusts figures from different eras into the mix with one another. Such a setting allows for a great many scenarios to play out and Maxwell ensures that Lazlo Cale is a bold enough character to be a bridge between all those said scenarios. Maxwell's dialogue is entertaining enough as he seeks to meld together characters and personalities from disparate eras. And despite the "bawdy" in the title, Maxwell doesn't resort to completely low-brow jokes in order to make the book entertaining. The perfect complement to Maxwell's script is Gligovic's artwork which doesn't take itself too seriously. That works in favor of the book in that it's an illustrative style that feels cartoonish enough to add some levity to the otherwise dramatic events unfolding in the script. Each character is drawn with a nod to caricatures, providing looks that are just as oversized as the personalities they're matching. The panels are laid out in a variety of ways, but primarily hewing to the tried and true standard grid format. Gligovic's color choice is bold and vibrant as well. 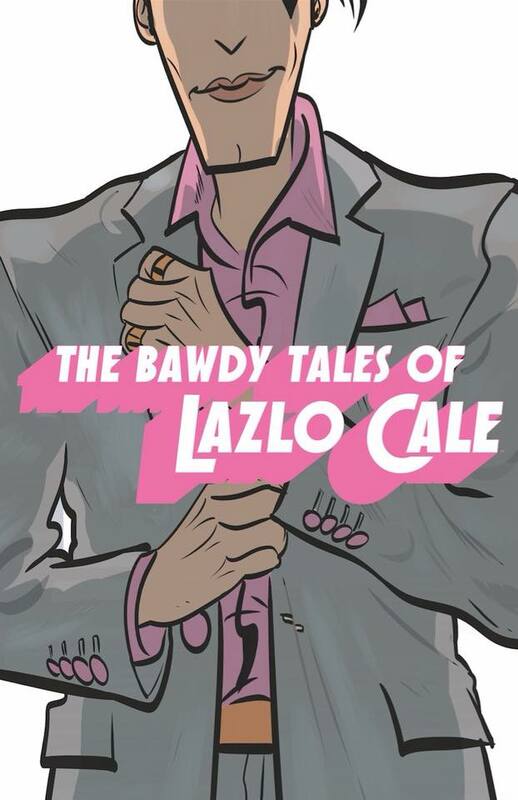 The Bawdy Tales of Lazlo Cale #1 is a pretty sound first issue that crashes through a brand new world. Lazlo Cale is a cad of sorts, but he's also someone who gets the job done. Maxwell's script is straightforward and engaging. Gligovic seemed to have fun rendering Lazlo Cale and his misadventures, providing a sense of airiness to the otherwise intense criminal proceedings. It's a first issue that's a little off the beaten path, but still worth a look if you're keen on aliens, anachronisms and artwork. The book is fully finished and the correlating Kickstarter campaign for pre-orders will launch on Tuesday, July 10th. In the meantime, you can follow all updates and artwork on the Facebook page: https://www.facebook.com/LazloCale/.